The 2011 film explores the life of a Polish Catholic priest who discovers he was born to Jewish parents killed in the Holocaust. 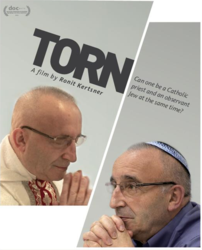 "Torn" is a 2011 documentary about an ordained Polish Catholic priest who learns that he was born to Jewish parents, who were killed in the Holocaust. Elms College will screen “Torn” at 7 p.m., March 27 in the Elms College Library Theatre. As part of the Jewish Federation of Western Massachusetts’ Seventh Annual Pioneer Valley Jewish Film Festival, Elms College will screen “Torn” at 7 p.m., March 27 in the Elms College Library Theatre. The film is a 2011 documentary about an ordained Polish Catholic priest who learns that he was born to Jewish parents, who were killed in the Holocaust. The film follows the journey of Romuald Jakub Weksler-Waszkinel. Filmmaker Ronit Kertsner raises profound questions about what it means to be Jewish in this soul-searching, cruelly ironic documentary about identity. A panel discussion will follow the 72-minute screening. Members of the local Jewish and Catholic communities will participate in the discussion and invite questions and comments from the audience. The film was nominated for Best Feature Length Documentary Film at the 2011 Israeli Documentary Forum Awards. To learn more about the film and to watch the official trailer, go to http://www.go2films.com/en/News-Releases/Torn. The screening is open to the public. The screening is jointly sponsored by the Elms College Office of Diversity Support Services, the Mary Dooley Lecture Series, and Consulate General of Israel to New England. For more information, contact Ann Schwein in the Elms College religious studies department at schweina(at)elms(dot)edu or 413-265-2575.